The Komodo National Park is located about 400km east of Bali, between the islands of Sumbawa and Flores. There are three main islands – Komodo, Rinca and Padar, plus many smaller islands. The most famous resident of the Komodo area must be the Komodo Dragon, but for divers it’s more important to note that Komodo National Park is one of the world’s most vibrant underwater environments. There are hundreds of species of corals, plus sponges and thousands of fish species, with the chance to see anything from pygmy seahorses to manta rays. Best time to dive is May to October. Water temperatures are highly variable. The south of Bali can have temperatures as low as 22 C, or as high as 28 C. In the northern area, the water is from 25 – 29 C. Long wetsuits are recommended. There are many liveaboard options in the Komodo area. We offer trips from 4 – 9 nights with trips available between March and December. 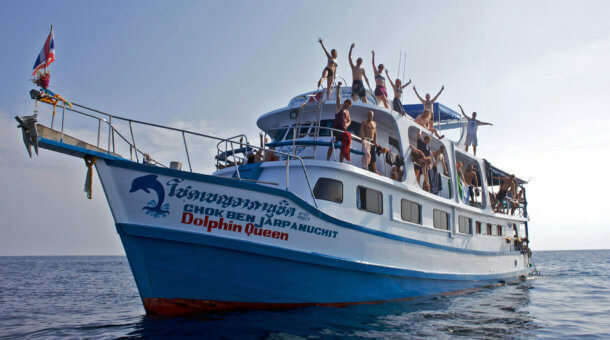 Some liveaboards depart from Bali, making longer trips including islands such as Moyo, Satonda and the volcano at Sangeang plus diving in the national park. Other boats depart from Labuan Bajo close to Komodo. 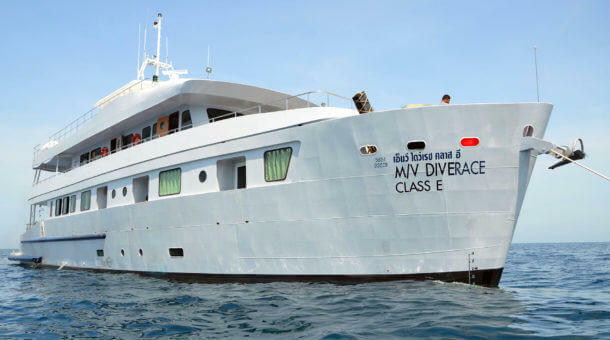 Most of the liveaboards will also include land visits and a chance to see the famous Komodo Dragons. 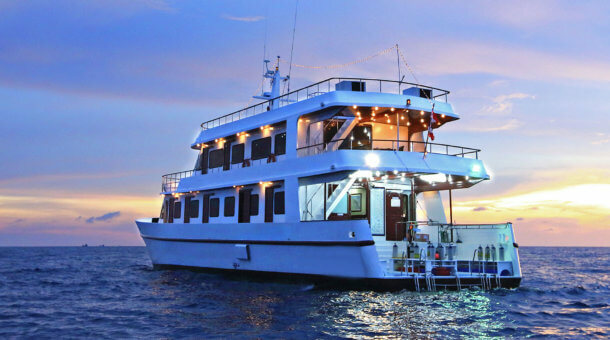 For a full list of liveaboard options – check here : Indonesia Liveaboards. 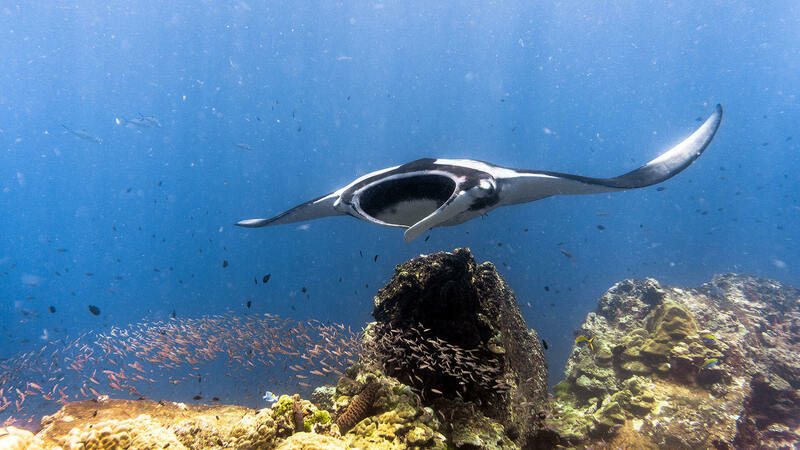 Probably the most famous dive site in the Komodo area and, yes, you are very likely to find Manta Rays here. Located in the far south of Komodo Island, inside the bay, you see some rocky outcrops at the surface, while under the surface you have an “alley” at 10-15m depth between the rocks, and a deeper section to the east down to 30m. The site can easily be dived more than one time. You may also find other large rays, big parrot fish or barracuda here. There can be a strong current and the water is often a little chilly at this dive site. Yellow Wall is another of the best dives in Komodo, located on the south of Rinca Island, Yellow Wall is indeed quite yellow, due to the many brightly coloured sea cucumbers and feather stars, a great place for Macro photos, but at the same time larger fish, sharks or turtles may also pass by. Located close to Komodo island on the northeast side. You find a flat channel which is mostly rubble, with some coral heads and soft corals. Manta rays come here to get cleaned, so the patient diver just needs to wait and watch. Sometimes 5 – 10 or even more at the same time. You may also find eagle rays here and other larger fish like wrasse or reef sharks. Tatawa Besar is about 8km of the north of Komodo Island and 10km north of the north of Rinca. There is often quite a current here and the dive starts with a drift – a site that needs a bit of experience as there can be some odd vertical currents too. Once out of the main current you find a sloping reef of orange soft corals that runs along the west of the island. Not a deep dive, only about 20m. A very good place to find turtles too. Batu Bolong (Hollow Rock) is a small rock that lies between Komodo and Tatawa. Nothing much to see at the surface, but below, the rocky reefs drop to 70m and features big schools of fish. Another of Komodo’s top “signature” dives – the reef is in superb condition. The coral is great plus there are lots of sponges, but it’s the fish life that makes this dive site. The sheer volume of fish here is incredible from the deep water where Napoleon wrasse, big tuna and white tip sharks are hunting, to the shallows where you encounter such dense schools that you can hardly see where you are going! Currents here can be strong. In general it is worth noting that Komodo is not an area for beginner divers. 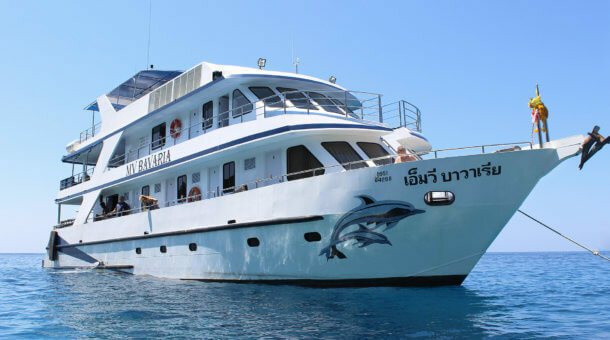 If you plan a liveaboard here, you should have a decent amount of experience. 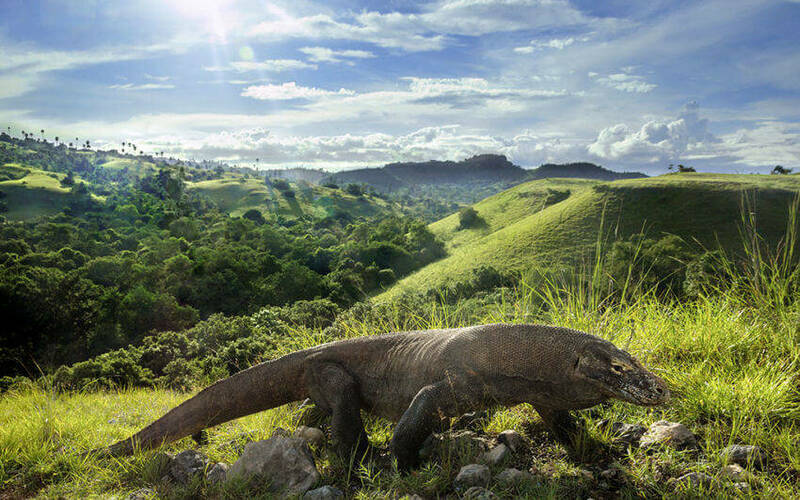 Komodo Liveaboard trips may include a chance to see Komodo Dragons! Castle Rock is located just off the north side of the small island of Gili Lawa Laut, north of Komodo Island. The current can be very strong. Several pinnacles point upwards from a shelf at around 24 meters, up to about 4 meters depth. It does look, some might say, like a castle. There are big schools of fusiliers and surgeon fishes and the mass of smaller fish bring trevallies, jacks, mackerel, barracuda and more – there is even a chance to see dolphins underwater. White tip and black tip sharks are also found here especially when a current is running. Crystal Rock is a pinnacle that just breaks the surface at low tide. Located just a few hundred meters from Castle Rock. 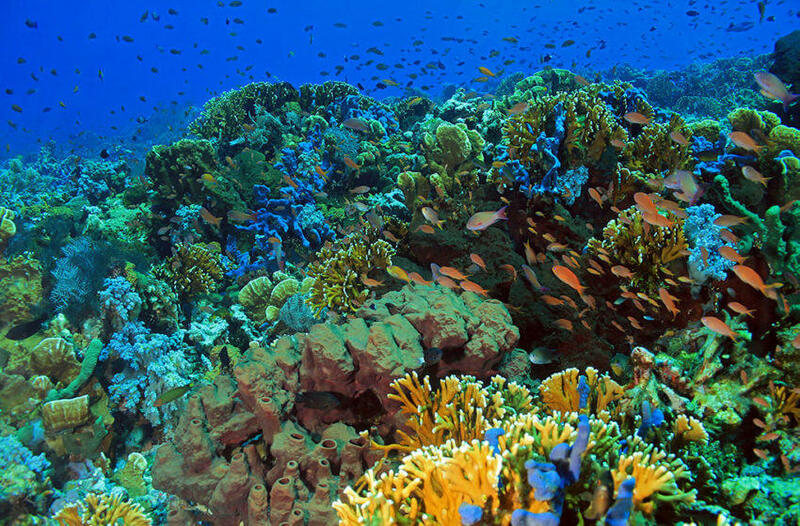 The reef features golden and orange sponges and soft tree corals. The shallow waters are home to large numbers of anthias and damselfish, plus you may find such creatures as large cuttlefish, butterflyfish, hawksbill turtles and octopus. On the north west side of Crystal Rock is a submerged mound rising from the bottom to 14 metres, with a 20 metre deep gap between. Best to dive at slack tide or the currents can be too strong, and you can find top schooling fish action here – sweetlips, snappers, Giant trevally, Napoleon wrasse and also white tip sharks.